I’ll play two sets – 6 to 8 p.m. – all in the cozy environs of The Drunk Brush Wine Bar on Grover Alley in beautiful greater metropolitan downtown Quincy, California. The libations are superb, the laughter infectious, the conversations rich. This venue has become an excellent community hangout. I’ll play two sets – 6 to 8 p.m. – all in the cozy environs of The Drunk Brush Wine Bar on Grover Alley in beautiful greater metropolitan downtown Quincy, California. If the weather allows, I’ll play outdoors. The libations are superb, the laughter infectious, the conversations rich. This venue has become an excellent community hangout. 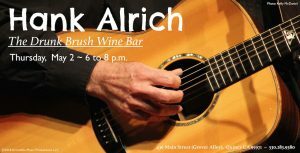 I’ll play three sets – 6 to 9 p.m. – all in the cozy environs of The Drunk Brush Wine Bar on Grover Alley in beautiful greater metropolitan downtown Quincy, California. If the weather allows, I’ll play outdoors. The libations are superb, the laughter infectious, the conversations rich. This venue has become an excellent community hangout. The 50th annual Almanor Art Show will be coming to Chester on the first weekend in August. Hosted by Collins Pine on their gorgeous shady lawn, there will be food and drink vendors, and live music! 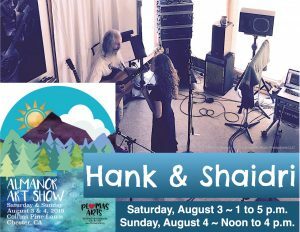 Hank & Shaidri intended to stretch their musical limbs, looking forward to exercising great chunks of their repertoire. One of Northern California’s finest juried art and artisan fairs, the Almanor Art Show boasts an impressive 80+ number of booths in which shoppers may delight. From fine art paintings and sculpture to precious metal jewelry, knitted accessories, garden art, and pottery, let the artists and creators tell you about their inspiration and process. You are sure to gain an appreciation for their art forms, and perhaps find something you can’t live without. Plumas Arts has organized the show for the majority of it’s existence, making it one of the few locally-sponsored art shows around. As such, proceeds will stay in Plumas County and benefit the many community-minded projects of Plumas Arts. Parking is ample and admission is free. The setting is gorgeous. It’s a great way to spend a day with friends, family, and the community.